Easy assembly with sections snap fitting together and secure with rivets. Model will provide good level of detail, review photos for detail, and is a great starting point for modeler to add high level of detail. Model for display or incorporation into your diorama or layout. 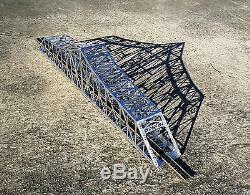 Bridge, Model 1910' is replica of a through truss bridge common to designs of the era. Model suitable for use in O gauge and S gauge. Model 1910', scales out at 5 Feet in length, and over 1 Foot in height from roadbed, accommodating most modelers space requirements, while capturing the character and mass of a Through Truss design. Photo of free standing bridge with no middle su pport pier at center span holding 35 lbs of architectural construction blocks piled on!!! I have opened up the internal clearance dimensions on the upcoming run of bridges. Deck will accommodate single O gauge track, depending on the rack you use. Also, bridge will meet NMRA standards for HI CAPACITY Cars at 5 1/2 height clearance. Production in 4 weeks so get your orders in for this run at the special price.. Photos of actual first model complete for "First Article" submission components and alignment of structural panels for fit & function testing!! Feel free to use any of the comments I've made thus far. It has a size and presence unsurpassed by any other kit bridge available, and looks even better in person than in pictures. Assembly was easy - took me maybe 45 minutes, and I've never used rivets before in my life. I've already gotten quite a few compliments on this bridge! 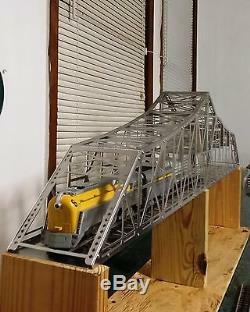 This massive bridge as a significant point of interest on your layout! Model is produce in aluminium so it is strong, easy to assemble, paintable and provides the "MASS" required to handle heavy locomotives and trains versus "plastic" bridges in the marketplace. Length: 5 Feet (60.69) approx. X Width: 5" x Height: 12.69" (at highest point, mid section tower). Model 1910' is addition to my. These bridges, often taken for granted, span large rivers and have played a major role providing a seamless rail transportation network in the United States. Today, after many decades of service, they are an intragel part of our transportation network. I have offered a line of architectural models, including bridges, viaducts, tunnel portals, retianing walls and structures found along the right of way s. Ince 1989' I originally started out building models replicating subjects I could not find in the market place. Goal is to offer several "Steel"models, intermediate to large designs, with good level of detail, a metal structure with sufficent size and detail, not exact, but close, capturing the character & mass of the prototype. Designs geared for the serious modeler. Model would be a significant point of interest for display or incorporated into your your home or club layout or diorama. Help me to access level of interest in producing this product. Suitable for N, HO, S & O gauge. Working up a price structure that will be affordable for the serious modeler or architecture fan. International orders by special quote. Sellers: Add a FREE map to your listings. The item "Model 1910' bridge, KIT Sale MAO $300.00 O Gauge single Track IN STOCK" is in sale since Friday, August 25, 2017. This item is in the category "Toys & Hobbies\Model Railroads & Trains\O Scale\Other O Scale". The seller is "trains04nw" and is located in Kathleen, Georgia. This item can be shipped worldwide.